Info Ekthcuthe me. You there. Would you mind helping me with my dentureth? I can't theem to do it mythelf. Teeth Polithe is a microgame hosted by Kat and Ana in WarioWare: Smooth Moves. It requires The Sketch Artist form. A cutscene after the first level is beaten. 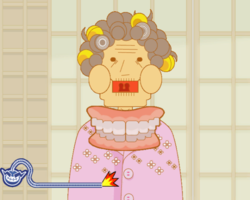 The player must use the Wii Remote to put the dentures into the elderly woman's mouth. 1st level difficulty: The woman does not move. At the end, she bites an apple. 2nd level difficulty: The woman moves from left to right. At the end, she bites a corn (a rice cracker in Japanese version). 3rd level difficulty: The woman moves from left to right and sometimes closes her mouth. At the end, she bites a carrot. This page was last edited on March 10, 2018, at 12:36.